TO ENJOY ALL MOD FEATURES, YOU MUST ACTIVATE SG 550 SHARPSHOOTER , QUIT THE GAME, AND START GHOST RECON AGAIN TO GET IT COMPLETELY ACTIVATED. Unzip "Masks_sr_wide.zip" in the .../textures folder of the mod, overwrite the two .rsb files. We have made these sniper scope masks at 1680x1050 res / 22" widescreen. Three (Main - desert, jungle and wood, Winter and Urban) addons featuring new custom sniper characters with "HyperStealth" cammo textures and a customized sniper model. Extract the "SG550SniperMainAddon.zip", "SG550SniperWinterAddon.zip" and "SG550SniperUrbanAddon.zip" to your ...\mods folder under Ghost Recon, then start GR,activate the "SG 550 Sniper Main Addon" mod at highest priority (this means the lowest item is your options-mods screen). The "Main" addon features desert, wood and jungle cammos, to use the winter or urban cammos you must always activate the "Main" addon plus the urban or winter addon at a higher priority than the "Main". All these add ons are non-overwriting and should work in SP and MP. We had to create these addons to open possibility to use the new sniper characters, but keeping the use of the standard or characters from other mods, when you dont want to use them. If we had added the sniper's characters and cammos of the addons directly to the mod, all sniper characters would use the "Hyper Stealth" cammo. Simply activate and deactivate the addons as you wish, playing with our five different cammos or from any other mod, including the GR original characters. All weapon kits and other features of the mod will work , no matter if the addons are activated or not. We have tried our hardest to get in contact with the creators of all work featured in this mod.If you find your work in this mod and it's not properly credited below do not hesitate to contact us (thales100@msn.com) and please accept our appologies. In this case we will change this readme in a future patch and include the missing credits. 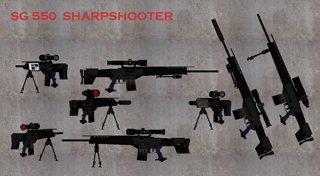 We fully respect and thank the authors for their hard work that has made SG 550 Sharpshooter Mod possible.The credits are very specific so the participation of the work of each modder can be easily understood. Other people may have also contributed to the mods listed below. -Ayu_Taiyaki for the body textures of all the sniper characters. -Ingeloop for the reticle of the HK MP7. -Wolfsong for the two reticles of the SG 550 Sniper, from his "Wolfsong SFFKC Mod". -Natsanwa for the models and textures of the HK MP7 and the HK MK23, from his "giftpack1". There is a thread about this mod at www.ghostaholic.com, www.woody2000.com and www.rainbowsix.org forums, you can post your doubts, comments, etc.., we'll try our best to give you support. You may also contact us directly to get support (PM at www.ghostaholic.com, www.woody2000.com or www.rainbowsix.org). All rights reserved. You may not modify or alter any of the files contained within this mod, or use its components without authorization from the authors. Please contact us if you are interested in using something from this mod, and we'll give you details (emails, etc...) on how to get the proper permission from the respective author, in case its not our own work. Afviklings tid: 0.4187 sek, 0.3745 af denne på forspørgsler.